Christmas was a week away and the drive across the Rainbow Peace bridge was void of delays. Our car drove up to the border guard’s booth where our driver, Sarah, pulled down her window and handed over our passports to the guard. He looked through each of them carefully, then to his computer screen. My heart raced and my breath shortened. Regardless of the fact that I have a squeaky clean record, custom checks make me nervous. I prepared my answers to the standard customs questions in my head but this effort proved to be worthless. The few minutes of interaction with our friendly border guard didn’t reassure me. Up to that point, I had been looking forward to what chicken wing aficionados have proclaimed as the “best chicken wings in Buffalo.” Dreams of Buffalo-style wings dancing in my belly were quashed in the brief exchange we had with our border guard. With his advice stamped into my memory, he returned our passports and we drove through the birthplace of the much beloved, deep fried winged appendages: Buffalo, NY. Our gastronomic journey began over pints of beers with friends Sarah, Mike and Eric a few weeks prior. 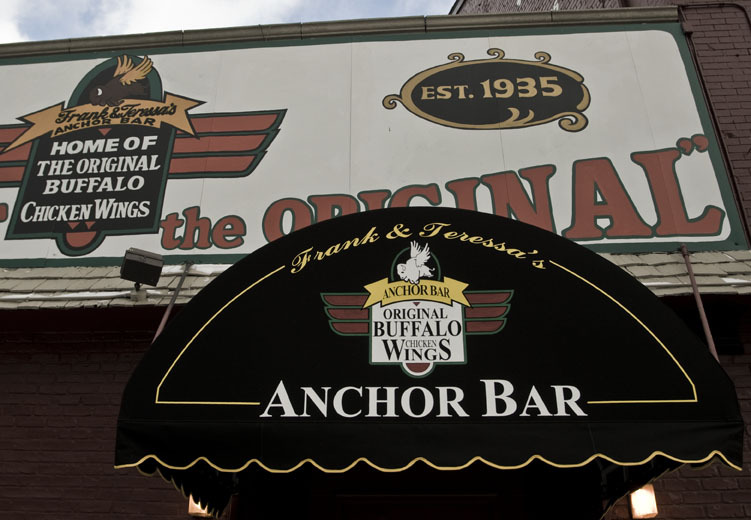 Sarah proposed a road trip to Anchor Bar in Buffalo, the birthplace of the chicken wing. It would be a day trip: leave Toronto early Saturday morning, eat at Anchor Bar for lunch, buy cheap beer and return home by evening. Like most Canadians who travel to Buffalo in search of good deals; the Anchor Bar was our Target. 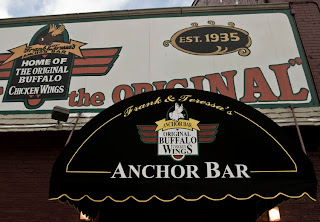 The story of how chicken wings were invented has a few variations but the most popular version dates back to 1964: Teressa Bellissimo, co-owner of the Anchor with her husband Frank, was working a late Friday evening when her son Dominic and his friends came over for a bite. To satiate their ravenous hunger, she whipped up a quick snack by using chicken wings that were normally saved for stock base, deep fried them and coated them in Frank’s hot sauce. She garnished with celery sticks and blue cheese dressing for dipping, and thus the “original” chicken wing dish was born. Since then the wings have become a national favourite and the Anchor’s claim to fame. Over the years the restaurant has garnered awards and accolades for their creation (a former mayor of Buffalo proclaimed July 29 to be Chicken Wing Day) and has become a popular tourist attraction. There, you can buy a plethora of merchandise all dedicated to the wing: t-shirts, key chains, chicken wing shaped hats. You can buy their famous hot sauce in bottle or in gallon form. If you crave the wings but don’t live in the area, the Anchor can ship them to you, even as far away as Japan. At noon, we had arrived to the bar that stands on the sketchy corner of Main and North St. Large words “Home of the Original” are painted on the exterior of the building. Inside is like stepping through a carnival’s Midway: licence plates, vintage Norton and Ducati motorcycles, baby carriages and musical instruments cover every inch of wall space. Hundreds of framed article clippings and signed photos of friends and celebrities hang from the walls. Seated in a quiet section of the restaurant, our group ordered a bucket of 50 chicken wings, half medium and half hot. We stayed away from suicidal, having been warned of their potency in uppercase and bolded font. With what seemed like a few minutes, our bucket of wings arrived on a large silver platter with a pedestal placed underneath it. Hands swooped in and grabbed the wings, it was my turn to test them for myself. I took a wing from the hot sauce pile and prepared myself for fiery sensation as I bit into it. The sauce had a kick but it didn’t overpower my taste buds. The wings were meaty yet small, slightly crispy yet some were dry. Each wing was well coated in the red, vinegary sauce. Like Dominic Bellissimo and his friends, we devoured our wings and dipped our celery sticks in the pool of hot sauce residue. After ten or so wings, my stomach had reached its limit. I rubbed my belly and thought of my verdict: the wings were good, but not the best. Did I expect too much? Perhaps. Would the wings at Duffs had been better? Our border guard’s recommendation replayed in my head. Behind the veil of pomp and pageantry, the Anchor serves up decent wings but I’m a gal who is less impressed with boastfulness. Take me to a place with minimal tchotchkes on the walls and a hot sauce that will wrestle my senses into submission. With our pilgrimage complete, our group left Anchor Bar and continued our journey through Buffalo. Somewhere there, the most succulent, saucy chicken wings are served, just not at Anchor Bar. Every journey has a valuable lesson. Mine? Never doubt a border guard’s food recommendation.